A Royal Bun in the Oven? by Gertrude, Queen of Denmark, Guest Editor for Ladies' Home Journal of Denmark, President of the Copenhagen La Leche League, etc. If the tabloid covers are true, which I've no doubt they are, Prince William and Duchess Kate are expecting a Baby Prince! Might it be a girl? How do I know for certain? Well, I do. Just because I do, that's all. I have a deep sense of things. An instinct, if you will. My own boy, Hamlet, knew this about me. Just as I knew that he loved me above all and everyone. And that it wasn't my fault that he had problems, issues, whatever you call those things nowadays. But I digress. The royal spotlight should be on that pair of attractive young Britons, not this handsome Queen. I am still handsome, by the way. No problem getting a man despite the obstacle of my little prince Hamlet who sometimes doesn't let his mother have a life. Kate's mother seems very nice. And William's . . . well, let's just say I've never cried so hard in my life as when she passed. She died tragically, attempting to fill a romantic and marital void, misunderstood and resented because she was so beautiful and charming and good. I could relate to the whole hot mess, obviously. But back to the Prince and the Duchess. How nice that things worked out with them! Both families must feel pleased and satisfied. And Kate has really handled all the pressure admirably. This is something that Ophelia failed to do, of course, she being of such a weak constitution. It was hard for Hamlet, who no doubt contrasted her behavior and mine. Isn't that the irony? 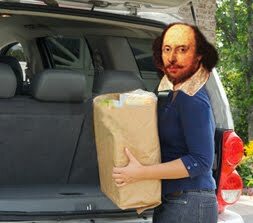 I get thrown under the bus because no woman holds a candle to me in Hamlet's troubled little mind.